"e;Humor, adventure, and tradition come together for another fun installment in Oliver Chin's Chinese Zodiac series. Don't be scared off by the scales and fangs. Suzie is one snake you'll wish you had around! "e;Michelle Loomis, San Mateo County Library, CaliforniaThe Year of the Dragon does a great job introducing kids to the dragons of Chinese lore, and offers a gentle tale of friendship,… teamwork, bravery, and acceptance. The illustrations by illustrator and cartoon character designer Jennifer Wood, who's done work for Nickelodeon and Cartoon Network, are colorful and dynamic and add a lot of appeal for both kids and grownups. The Year of the Dragon is highly recommended for Chinese New Year, or any time at all, for that matter. "e;Marin Mommies2013 is The Year of the Snake! Suzie is a young serpent who seeks high-flying adventure. The girl Lily befriends the snake, much to her grandparents' chagrin.However, Suzie aims to shed others' negative perceptions of snakes. Can she prove her versatility to Lily's family and the neighboring animals? And what will Suzie do when the wisest choice is to lie low?Suzie's journey to discover her unique personality will delight kids of all ages. 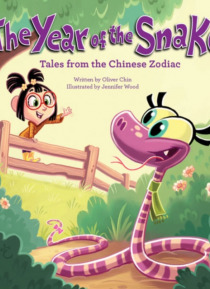 Eighth in the annual Tales from the Chinese Zodiac series, The Year of the Snake shows the charming characters of the Chinese lunar calendar and how an adaptable attitude can overcome all obstacles.Oliver Chin lives in San Francisco, California.Jennifer Wood is an animator at Nickelodeon in Burbank, California.